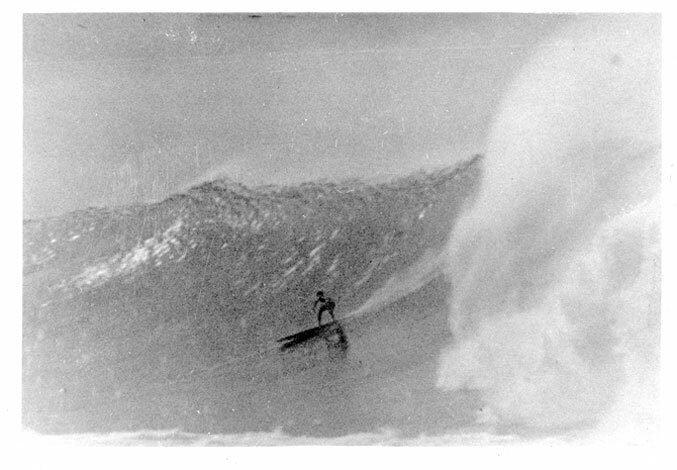 I am indebted to Nobuhito “Nobby” Ohkawa --大川信仁 -- for helping to preserve the early history of Japanese surfing, making it more widely known throughout the world, and allowing me to draw from his research. Nobby’s website is a cultural resource for learning about Japanese body boarding, the boards that were used and the locations where it was practiced. I encourage you to visit the website at: http://www.nobbywoodsurfboards.com/20.html. It is rich with images as well as text both in English and in Japanese. Certain beaches in Japan have a tradition of body boarding that’s nearly two hundred years old and possibly a little older. From the mid-Edo Period [aka Tokugawa Period, 1603-1867], Japanese style wooden boats were crafted due to the then-new technology of timber processing. Previously, fishermen had used canoes made by hollowing out and shaping logs. Most Japanese-style milled wooden boats had removable floor boards that were called Itago. When the boats were beached after fishing, the children of the fishermen took the Itago out of the boats and used them as kick boards and body boards. This practice was commonly known as Itago-nori, meaning “Floor board riding.” It is also called Itakko at Oiso Kanagawa, Setsukashi at Niijima Island on the Izu island chain, Senoshi at Yamagata, Northeastern Japan, and Sebuta at Tokushima Shikoku. These different names -- such as “Itakko” or “Itago” – are due to the different regional nomenclature. In the 1880’s, bathing beaches were opened up as locations for people’s health improvement. 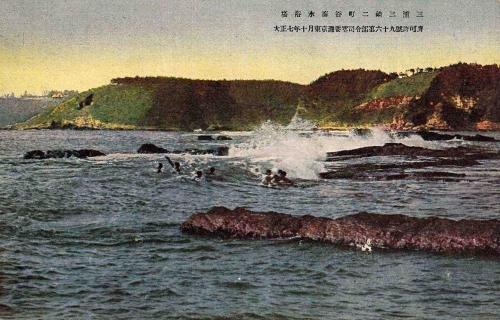 These beaches gradually became public beaches that Japanese visited in their leisure time. From this point on, Itago boards became more of a wave riding tool than a boat floorboard and were widely made. 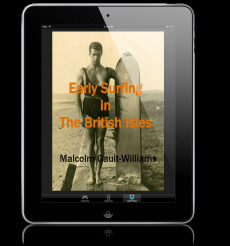 The boards were used as lifesaving devices for fishermen and for wave riding by their children. The dimensions of Itago were length: 60cm-to-120cm, width: 30cm-45cm, thickness: 2cm-3cm. Most of the boards were made of Japanese cedar, although a few were made of Paulownia. In some cases, surfers even used old-fashioned wood washboards as Itago substitutes. Almost all Itago were flat with no rocker and had a rectangular outline with a handle hole in the nose. However, some surfers didn’t make a handle hole because they didn't like the water that came out of the handle hole which hit them in the face when riding. Itago were held vertically, a riding style called Tate-nori, but, when taking off on a steep wave, it was held horizontally -- a riding style called Yoko-nori. After the 1890’s, Itago riding skill improved with the growth of the Itago rider population. This evolution prompted an Itago riding competition that was held at Oiso in July 1909. Ten years later an instructional solely devoted to Itago-nori was written in 1924 by Saburo Sato. As Itago-nori became popular and widely used as a tool to assist with swimming, kickboarding and bodyboarding, beach houses would rent them out to vacationers. The boards were painted with the name of the beach house that rented the Itago or the name of the company that supplied the boards. World War II arrested activity at all Japanese beaches, as it did all over the world. After the war, soldiers in the American occupation army brought surf mats to Japan. Riding Itako changed to surfing rubber mats at bathing beaches. After that, Itago almost completely disappeared with the introduction of “boogie boards” in the late 1970’s. Ohkawa, Nobuhito “Nobby.” “Traditional Surfing in Japan, An Unknown History,” updated 10 May 2017. In the late 1920s, a 9-foot Waikiki surfboard was brought to Chigasaki, Kanagawa, by Shinjiro Mori. Around 1931, a hollow board was constructed that was much like a big plywood bodyboard. It was called a “Float” and was made by Kamakura, Kanagawa shipwrights. See image at Nobby’s website.